For many years Veronika van Duin has been able to see 'over the river' - experiencing spiritual dimensions and worlds hidden to the physical eye. With clairvoyant vision she has perceived angels and demonic beings, people who have died, and even events taking place in other parts of the world. But with the passing of her mother - Barbara Lipsker, MBE - in 2002, Veronika van Duin's spiritual journeys became more concentrated and frequent, and she began to see people who had recently crossed the threshold of death, including the victims of an aeroplane disaster and a suicide bombing. 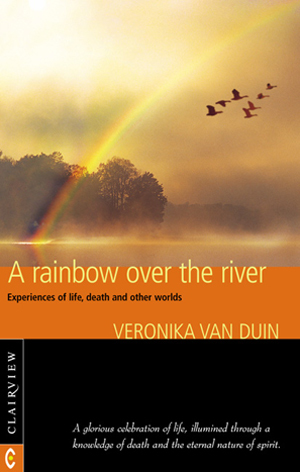 In A Rainbow Over the River the author tells her remarkable story, from her earliest glimpses of the Other Side to her most recent excursions 'over the river'. In the second part of the book she records an intensely moving diary of her mother's passing, rich in love, care and a profound understanding of suffering. She describes how, despite the sadness of losing their mother, Veronika's family see the death as a transition to a new existence, and ultimately as a great festival of life. In the third section of the book she speaks of her mother's life as a pioneer of Camphill, a social movement that provides home and work for people with special needs. She also offers thoughts on birth and death, grief, healing, prayer, and the meaning of existence.